And if you look at any car built in the last decade or so, there’s probably also a flat, rectangular satnav or infotainment screen dominating the central console. These screens are almost ubiquitous in the latest generation of cars – even the glitzy concept cars that grab the headlines at motor shows around the world – and seem to be getting bigger and bigger. These LCD displays are often the only flat surfaces left in the vehicle, disrupting the form and flow of the interior space and limiting ergonomic options for designers. So why not replace these flat panel displays with something more aesthetically pleasing, that still offers the same visibility and functionality without creating design ‘dead spots’ in the dashboard? Historically, this hasn’t been an option, as the technologies required for flexible and reliable LCD displays simply haven’t existed. 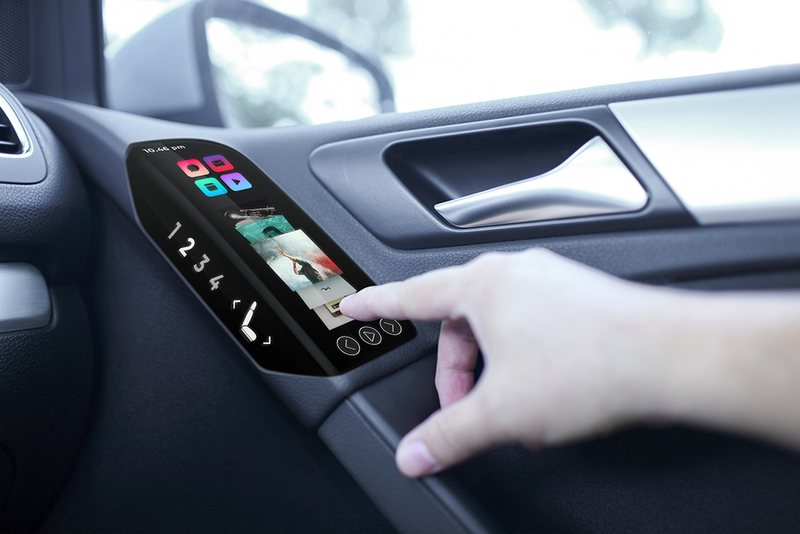 While glass LCD screens have been in use in the automotive industry for many years, these only offer very limited curvature, requiring flat or near-flat surfaces to allow seamless integration. However, this is set to change, with the advent of our flexible plastic Organic LCDs (OLCD), enabling screens to match the curving lines of modern car interiors. So, assuming we’ve solved the issues around dashboard design, where else could this technology be incorporated into vehicles to improve both form and function? The same principle can certainly be applied to the TV screens built into the back of the driver and passenger headrests of many large family cars. No more blocky designs – just seamless curves. There are also a number of other, less obvious areas where this technology could be applied. One concept – which has already been seen on Novares’ third-generation Nova Car – is to build curved screens into a vehicle’s A-pillars, serving one of two potential roles. Firstly, they can be combined with discreet rear view cameras to provide a virtual alternative to traditional wing mirrors, allowing cleaner exterior lines and reducing drag to offer better fuel economy. Alternatively, these screens could be used to make the A-pillars ‘invisible’, projecting an image of what is behind the pillar onto the screen to eliminate this blind spot – an important safety consideration at junctions. These are just a few examples of how flexible OLCD screens could be used to enhance vehicle design, and we look forward to seeing other applications emerge from the imaginations of car manufacturers. If you are looking for a flexible display solution, get in touch with us at info@flexenable.com.